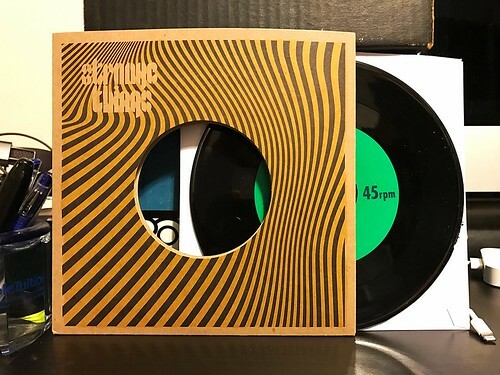 I Buy Way Too Many Records Dot Com: Strange Things - Higher Anxiety 7"
Next up from the batch of La-Ti-Da singles that I picked up is a band from Vancouver called Strange Things. All I can do is think of the show Stranger Things when I see their band name. An unintended consequence I'm sure. I often talk about why I like singles clubs and while the La-TiDa blind buy I did a while ago wasn't a club exactly, it was me committing to purchase a bunch of records that I didn't know if I'd like. It often works out great, but there is the occasional dud. You can call this particular dud Strange Things. There's nothing inherently bad about them, if you like this sort of thing. The problem is I do not like this sort of thing at all. Strange Things are playing the sort of 60's tinged psych throwback nonsense that made me stop buying records from Trouble In Mind. There is so much great music from the 60's, why bands insist on mining this particular strain is something that I don't really understand. The recording of the songs is cavernous, the band sounds like they're about a mile away from the nearest microphone and all of the sounds sort of blend together into an indecipherable drone. The vocals are buried, but since they are pretty monotone, I suppose that doesn't really matter all that much. With all of that said, these guys could be the best band in the world at playing this type of music, but I'd never know as it just isn't the sort of thing I like listening to.